Break a sweat this fall with two new unique workouts debuting at the Sky Line Rooftop at Hotel Valley Ho. When yoga is followed by mimosas and pool time, we’re all there. Taking place select Sundays, the one-hour energizing yoga class will be hosted by Veronica Clark with chill beats by DJ Soloman. Take in the views from the rooftop before following up that Warrior 1 pose with a visit to the mimosa and bellini bar at the OH Pool. Or, have some cold-pressed juice from Kaleidoscope who will be on site for a little nutritional pick-me-up. 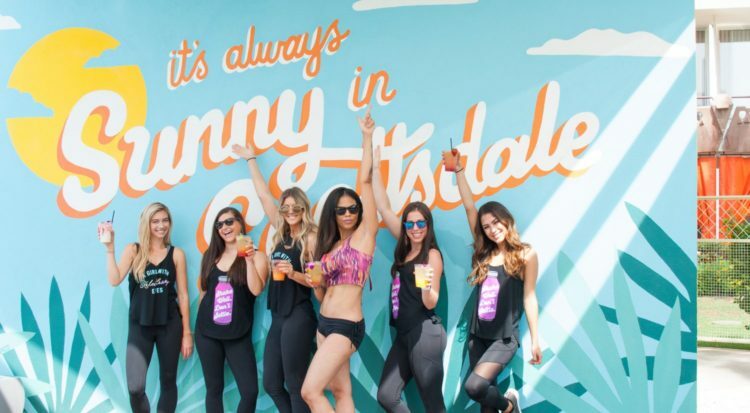 Top off the day with a dip in the pool or a photo-sesh by the “It’s Always Sunny in Scottsdale” mural. Your $25 ticket includes the class, a poolside mimosa or bellini, valet parking and a 25% off voucher for brunch at ZuZu. Sep. 23, Oct. 21 and Nov. 18 at 9 a.m. Tickets here. Pick up the beat and kick off your morning right during this energizing workout led by Raquel Kahn of local studio Fix 6-7-8. Bring out your best Beyonce, Rihanna and J-Lo while moving to an electric beat of hip hop, top hits and high-energy beats. Let your inner diva shine and your hair whip back and forth. Approved by Elle and The New York Times, The Vixen Workout is a perfect blend of dance, fashion, music and fitness. Your $25 ticket includes the rooftop workout, valet parking and 20% off food and drinks at the OH Pool. Oct. 14 at 9:30 a.m. Tickets here.